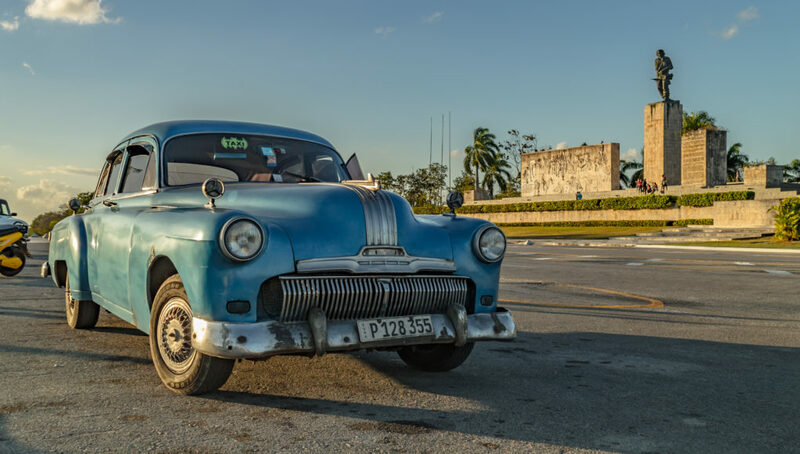 One of Cuba's famous pre-Revolution U.S.-made cars parked in front of the Che Guevara mausoleum and monument in Santa Clara, Cuba. Just outside of the city of Santa Clara, Cuba, the mausoleum of Che Guevara attracts travelers, mourners, and revolutionaries from around the world. Che’s remains are entombed inside the monument, under the base of the statue of him. The statue of Che Guevara at his mausoleum at Santa Clara, Cuba. Che is entombed in the monument along with six of the men killed during the battle in Bolivia after which Che was captured. A museum adjacent to his tomb displays artifacts from his Cuban and Bolivian military campaigns. The Che Guevara Mausoleum at Santa Clara, Cuba, sits across the highway from Plaza Che Guevara. Officially named the Conjunto Escultórico Memorial Comandante Ernesto Che Guevara, the mausoleum and monument were completed in 1988 and have undergone a major renovation as of October 2017. The statue of Che is remarkably lifelike and is modeled after a photograph of Che leaving a hospital after being treated for a combat wound. One major difference between the two is that in the photo, Che is not carrying a rifle, as he is in the statue here at Santa Clara. The statue of Che Guevara at his mausoleum at Santa Clara, Cuba, is based on an actual photograph of him leaving a hospital after being wounded in the left arm. In the photo, there is no rifle. Previous articleCuba is in love with its cats.